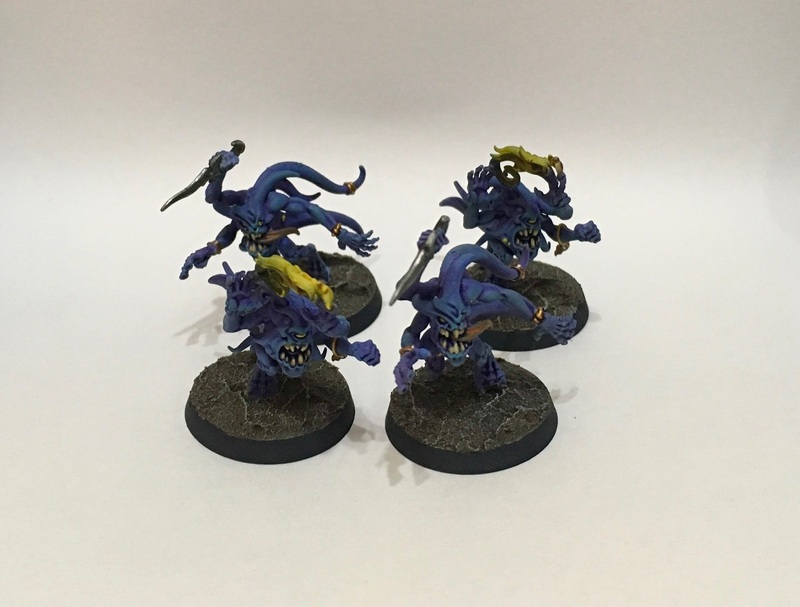 Next on the Silver Tower list was the Blue Horrors, these are exploded out of the Pinks as the Horrors die, the crazy faced offspring! I will admit, I followed a Duncan video for these guys but if you haven't seen it here is 'How I (and Duncan) Paint' the Blues! I undercoated the Horror in Corax White and base coated him in Calgar Blue. This was before washing the mini in Druchii Violet. And finished the Skin with an all over dry brush of Temple Guard Blue. For the flames in 2 of them, I used Flash Gitz yellow in a glaze form (thinned a lot with water). I also used this to paint their eyes and the spots over the body. The weapon was based in Leadbelcher and washed in Coilea Greenshade, the Gold was based in Retributor Gold and washed with Reikland Gloss, both were then highlighted with Stormhost Silver. For the tongue, I applied two glazes of Troll Slayer Orange. Finally, the teeth were base coated in Zandri Dust and layered with Ushabti Bone.